Should I hire an Iowa lawyer if I was hurt at work in a factory? Should I hire an Iowa lawyer if I was hurt at work in a factory in Davenport, Iowa? If you have been injured at work and are unsure of what to do, seek an Iowa lawyer. It is important to keep in mind that not every accident or injury will warrant a Davenport, Iowa workplace accident claim. A lawyer can discuss why or why not your case qualifies for that type of legal action. Take action right after the accident takes place. Some people are hesitant to take action because they are nervous or feel overwhelmed. The accident needs to be reported properly right away. Get the medical help you need. If you have been hurt in the workplace, you need to get medical attention as soon as possible. Don't underestimate the injury; get examined by a medical professional. Give a detailed description of what happened. Your attending physician will need to know the whole story. Describe the incident as clearly and in as great detail as you can. Include the detail that it occurred while you were at work. Later on this can help if you file a worker's compensation claim. At the end of your visit, get a doctor's note. If your injury stops you from being able to work for a period of time, you need a doctor's order in formal writing to support your claim of the accident. Contact an Iowa lawyer to file a claim. When you add up lost wages and medical bills, the costs run high quickly. It may be in your best interest to file a worker's compensation claim to recover those losses. The Davenport, Iowa Workers' Compensation attorney team at Walker, Billingsley & Bair know the importance of protecting your work injury claim from the get-go. 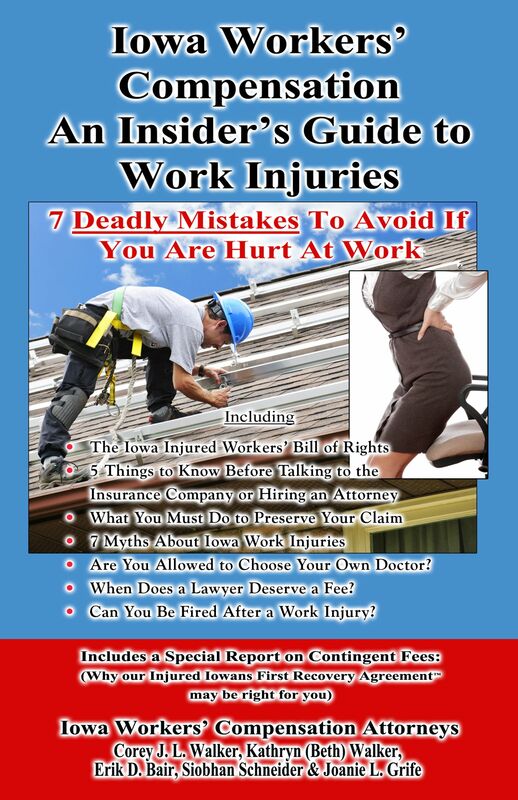 Learn more by ordering this FREE book; Iowa Workers' Compensation - An Insider's Guide to Work Injuries: 7 Deadly Mistakes To Avoid If You Are Hurt At Work or by calling 1-800-707-2552.